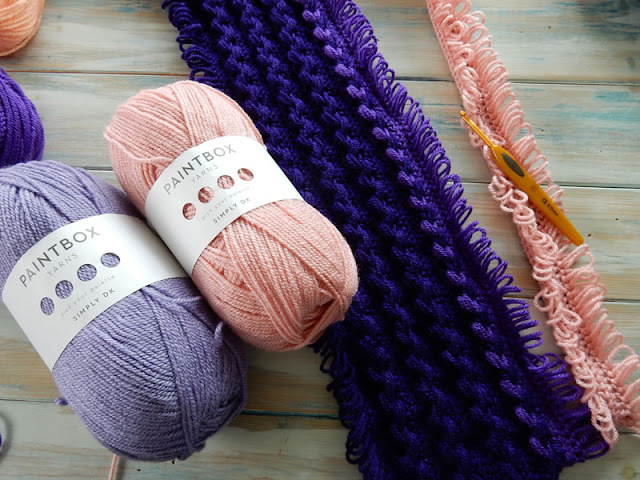 Another gorgeous yarn review coming your way today, this time for the new Paintbox yarns! and of course a free crochet pattern from me for this squishy soft Loop Stitch Braid Baby Blanket. I was delighted to be one of the first to get my hands on the new range of yarns by Paintbox, which are exclusive to LoveKnitting.com and LoveCrochet.com who I am big fans of as you know, and I've been working with their DK (double knit) range for over a week now with this blanket and I have to say, I am loving it. I'm a big fan of 100% acrylic and 100% cotton yarns anyway for ease of use as a mum, so what better than a whole host of colours to choose from, which can all be shoved in the wash at a moment's notice! The name Paintbox is most definitely apt for this range of yarns because they literally do come in every conceivable colour! 60 shades to choose from! 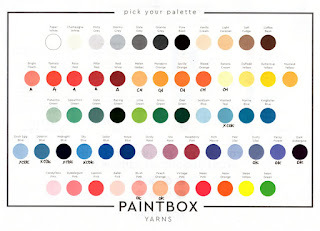 Paintbox describe their yarns as "modern, playful and all about colour" and I have to agree. The range comes in 3 weights in the acrylic, DK (light worsted), Aran (worsted) and Chunky (bulky), and the cotton comes in a DK (light worsted) weight, which is perfect for those amigurumi projects! I have yet to experiment designing and crocheting with the Aran and Chunky weights yet (stay tuned for that), but the DK weight has been an absolute pleasure to work with. 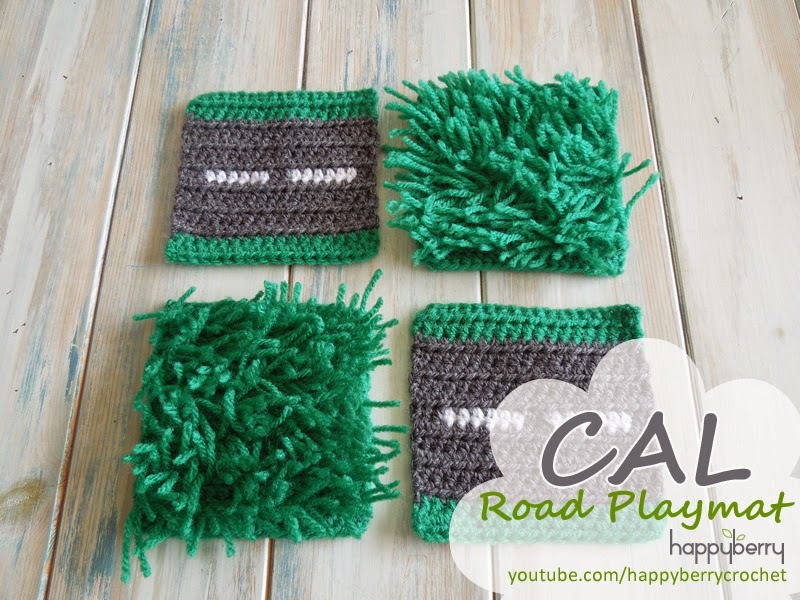 The texture is smooth, soft and easy to crochet. I haven't found a single knot and the yarn doesn't smell chemically at all. These are some of the big things I look out for in a new yarn I haven't tried, as well as of course the most important squish factor he he, which in this case is extremely high! 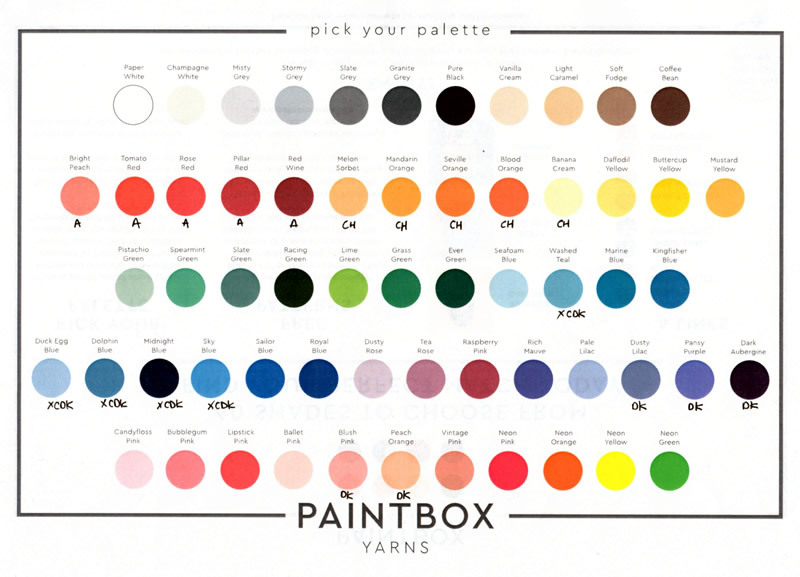 There are 60 shades in total to choose from, and the Paintbox yarns are an affordable choice as well. There are also lots of free patterns that come with this new yarn range, which you can download now on their website, such as this adorable Caitlin the Caterpillar. But for now, why not try my Mile-A-Minute Loop Stitch Braid Baby Blanket (phew what a mouthful), which I designed to show off a rather plummy pink palette choice. This blanket measures approximately 30 inches x 30 inches, so works perfectly as a cot blanket or stroller blanket. You can of course use any brand, or weight of yarn for this blanket. A thicker yarn used with an appropriate sized hook for that yarn will make a bigger blanket, and a thinner yarn a smaller one. If using Paintbox yarn, I chose 5 colours in total; 1 ball in each of Dark Aubergine, Pansy Purple, Dusty Lilac, Blush Pink and Peach Orange in DK weight, and with this yarn I used a 4mm crochet hook. Step 3. Sl st twice down edge to opposite side, and crochet 1hdc loop stitch in ea foundation ch across - (132) Fasten off, keeping a short tail for securing braids. - Repeat steps 1-3, 19 more times until you have 20 strips with 132 loops either side. Take two strips and braid them together by dividing the loops into sets of 4. Pass 4 loops onto your hook from one strip, then take 4 loops from the opposite strip and pull them through the first 4. Then take 4 loops from the opposite strip (the first one you started with) and pull them through the 4 loops now on your hook. Repeat this until the end. Secure the last 4 loops with your tail end. - Now take your next strip and repeat the same process, but start from the opposite side. This is important to level off your blanket. If you start the same side each time your blanket will look wonky. See video if unsure of any of these steps. - To finish braid edges, take 4 loops, and another 4 from the same strip (you have to as there is no joining of strips) and pull the second lot of 4 loops through the first 4, take another 4 loops and repeat until the end. Secure with tail end and repeat for other side of blanket. Make sure they face the same direction as all your other braids. Tie in all tails. Optional Edging: Re-join yarn in one corner, *crochet [2tr, 2dc, 2tr] into centre of first two sets of loops (2dtr, 2tr, 2dtr in UK terms), sl st in centre of next strip* repeat from * until end. Repeat for opposite edge. Tie in all tails. This blanket used about half of each ball as shown here. *Please Note* I am not being paid by any of the mentioned companies to make this content other than receiving yarn to review, and neither Paintbox or LoveCrafts have control over my content. The views in this blog post and the video tutorial are strictly my owns. Proud to be a genuine reviewer! HappyBerry has Joined the Flock! I was so excited this morning to realise I have been accepted into the awesome new blogger ambassador programme from LoveCrafts, that I just had to share its awesomeness with you all! I've worked with a few companies over the years as a crochet designer, but none so amazing and kind as the team at LoveKnitting and LoveCrochet. Since late 2014, the lovely people at LoveKnitting and LoveCrochet have been so amazingly supportive of what I do. From the very beginning of me joining their team of indie designers they were there for me to help promote my work, and support me at a time when EU tax rules were causing great concern with online digital pattern sellers. They literally swooped in amongst all the chaos and worry, with a great virtual cushion and said, "hey, it's all going to be ok", and it was. Since then they have been a valued support network for me, from promoting my work, to supporting me with the growth of my profile, and of course helping me see my pattern sales grow. I am now blessed enough to be offered yarn support and new products to review and play with. I feel so honoured to be apart of something so exciting and fun! And I can't wait to see what the future brings. But you can get involved too! So what is the Flock? 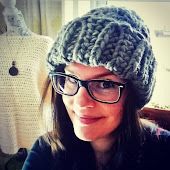 The LoveKnitting and LoveCrochet teams have been working tirelessly to continue building a cozy home for us knitters and crocheters, and they wanted to build the blogger ambassador programmer to recognise what us bloggers do for the yarny community. They wanted to create a community where we can come together and share ideas, collaborate on projects and review products, as well as have some fun along the way! The LoveCraft teams are way more than just an online yarn shop. They are real people who actually care about what you do, and what you bring to the crafting community, and the Flock is about developing you and your blog. As a Flock member your content will be featured regularly on their websites and social media channels and you'll be kept up to date with all the latest collaboration opportunities to help you connect with your fellow makers! I have a blog, and I want to join I hear you cry! If this all sounds amazing for your blogging future, then you can easily express an interest in joining by signing up here. Once the LoveKnitting and LoveCrochet teams know you're keen, they'll pop over to your blog and take a look at what you do. If your blog looks like the kind of thing their makers will love then you will automatically become a VIP blogger and member of the Flock. Once fully immersed in the flocky goodness you will receive their latest updates, collaborations and content opportunities before anyone else and you can start to enjoy the benefits listed above. Click here to get started!! or find out more here. A few days ago I was lucky enough to get my hands on some gorgeous new yarns from MillaMia, exclusive to LoveCrochet.com. If you are new to the MillaMia yarns they are rather famous for their more luxurious merino yarns, so I had quite high expectations for their new Naturally Soft Cottons. So this post is going to be a bit of a review as well as a new pattern for you guys! 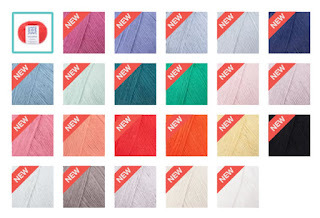 The first thing I noticed though was the range of colour choices in this new cotton range. I've never been a huge fan of yarns that only come in a few different shades. I do love my colour, and I love being able to get a wide variety of colours from the same brand of yarn. The Naturally Soft Cottons didn't disappoint. There are a choice of 22 new shades, from soft pastels to deeper tones. There are some really nice beachy baby colours as I like to call them, but also some rather vibrant impact choices too, so lots to choose from. I chose to work with the colour Sweetpea, which is like a greeny light blue shade, Bright Purple which is such a vibrant plummy colour and also Pure White as a great clean base colour for my Baby Cardigan design below, but of course you can use any colour choices you like (and of course any yarns that you like that come in a 4ply/Sport weight). Initial squish factor is also high up there! These yarns don't even feel like cotton and are super smooth to work with. They don't feel stringy or too rough in texture, and the finished result is a wonderful drape. You can see me working with this yarn in my video tutorial below. Lastly, one huge bonus for the new range of Naturally Soft Cottons, especially if you are already a fan of MillaMia yarns, is that they have the same tension as their merino yarns so you can mix and match and substitute as need be between them all. There are also some adorable MillaMia knitting patterns to coincide with these new yarns coming out, which I'll link below. I hope you enjoy! This pattern only uses basic stitches such as the half double and double crochet so is suitable for beginners. Without fastening off, work 4dc in ea large gap up side edge (the gap before last 2dc on each alternate row) back to collar, starting in same 1ch sp as last worked, sl st in last st of collar and fasten off. Repeat for other side edge, starting at collar and working down. Tie in all tails. Happy crafting and see you soon for some more crochet fun! *Please Note* I am not being paid by any of the mentioned companies to make this content, and neither MillaMia or LoveCrafts have control over my content. The views in this blog post and the video are strictly my own and I am not affiliated with any of these companies. Proud to be a genuine reviewer!